AE Techron products are designed and built to be tough, with many protections and safeguards built in. That means often issues can be resolved without the product being sent in for servicing. We recommend following our 3-STEP Service Process to resolve any product issues as quickly as possible. We recommend making the Tech FAQs the first stop for any AE Techron product problems. Many common issues associated with incorrect connections or system faults can be resolved quickly, by you, at your facility. For questions that are more complex and can't be resolved using the Tech FAQs section of our web site, we have factory-trained application engineers available to respond to your questions.
) from 8am to 5pm EST. Our response goal is for you to hear back from us within 1 business day. If your AE Techron product can’t be repaired at your facility, contact our Factory Service Center or one of our International Service Centers to return the product for servicing. Q: Can I adjust the DC offset of my amplifier? A: The DC offset can be adjusted using a rotary pot on the main board. Please contact technical support for a work instruction and please have the model number also. Q: Can I set the amp to DC Blocking? A: The DC blocking can be set by creating what is essentially an RC high pass filter in the preamplifier stages. Please contact technical support for more detailed information and a work instruction. Q: How do I identify the amp model? A: Look on the back panel, for a rectangular black sticker. It should have a four-digit model number followed by an eight digit serial number. Q: What is the proper way to connect signal and measurement devices? A: The amplifier is separated from the equipment ground on the amplifier case. The case is supplied with a equipment ground, which is connected to the amplifier only through the 2.7-ohm resistor on the rear. Connection should be made either with isolated equipment (which have proper safety and equipment grounds), or extra care should be taken to ensure that all equipment grounds on all devices are at the same ground potential. Small differences may lead to undesirable currents, manifesting by heating or blowing the 2.7-ohm resistor. Q: Why is there a resistor between the amplifier output and the chassis ground? A: The amplifier is essentially floating with respect to the enclosure. The amplifier and enclosure are tied together only at the point where the 2.7-ohm resistor connects. This stabilizes the amplifier and protects the connected equipment. It is strongly advised that the amplifier never be operated without this resistor being in place and in good working order. Q: Can I change the gain of the amplifier? A: The gain of the amplifier can be adjusted either in a fine adjustment of a few per cent, or the overall gain can be adjusted small to large values. For the 7224 the gain can also be fixed (bypassing the rotary control on the front). Please contact tech support for a work instruction. Q: What is the best way to adjust the CC2 compensation for Controlled Current operation? A: There is a 3-pin (0.1” spacing) header at junction J5. A small thin solderless PCB protoboard can be soldered to the pins used for the custom compensation and resistors and capacitors can be repeatedly connected and detached from the PCB protoboard. An example is manufactured by BPS model BR1. Q: What is the purpose of the high/low/auto settings? A: The amplifier employees a two-rail system with a bilevel switch that transitions from the lower rail voltage to the higher rail voltage as input and gain dictate (in the auto position). By locking the amplifier low, the amplifier is restricted from using the higher rail voltage (and limited to a lower voltage output), which increases efficiency and permits higher current. The high position eliminates the need to transition from the lower rail, improving signal tracking especially at higher output voltages and high frequencies. Q: Can I operate the amplifier without the 2.7-ohm resistor between the output common and the chassis ground? A: In certain special circumstances it may be possible to replace the resistor with a jumper. Please contact technical support to discuss this if you believe it is necessary. Q: What are the tolerances for AC power requirements? A: The amplifier is designed to operate within ±10% of nominal AC power voltage. All amplifiers should be provided with an equipment ground as part of the AC power supply. Q: What might be causing a hum, or some other kind of noise on the output? A: Check the selector switch on the input card on the back of the amplifier. Normally it should be chosen to reflect the type of input used, but in some cases it may be necessary to use the differential switch setting when using the BNC connector in order to provide a ground lift. Q: The signal should be inverting, but is not. A: The inverting setting should be used only for series differential configurations. In this case only the slave amp should be set to invert. Q: What input card is needed for my multi amp configuration? A: When operating in a series configuration, all amplifiers require an optical isolation card (or “OPTOC”). Series and parallel configurations also require specialized communication cables (which are different for series and parallel), and other accessories. See section 1 of the Multiamp Configuration Guide. Q: Do all amplifiers in a multi amp set need the same adjustments? A: In general each amplifier in a gang of series or parallel amplifiers each need their own settings. Consult the Multiamp Configuration Guide, or feel free to contact tech support. Q: How do I configure the grounds for multi amp operation? A: When operating in series, single ended configuration it is very important that only the master amp have the 2.7-ohm resistor. The single ended series slave amplifiers should have the resistors removed and the connection between the common and chassis ground left open. For series differential and parallel configurations, the 2.7-ohm resistor should be in place for all amplifiers. Q: Can I operate amplifiers in multi amp configurations and in Controlled Current mode? A: The 7224 series amplifiers should be operated in multi amp configurations in Controlled Voltage mode only. The 7548 and 7796 can be operated in parallel in controlled current, with only the master amplifier requiring compensation. Q: What does the Fault/Warning “Overload” mean? A: The input commanded an output that the amplifier could not track. The output signal is generally seen as clipping. Normally the amp can be reset. However the amp can be set to go into standby upon overload. Note that the error signal is extremely sensitive (detecting errors as small as 0.05%) and the overload light may illuminate even when a satisfactory output is obtained. COMING SOON. For assistance with this area, please contact AE Techron Tech Support at 1-574-295-9495. AE Techron Factory Service is located in Elkhart, Indiana, USA, and is available to customers worldwide. To begin the return process for Factory Service, please complete an Service Request. After completing the RMA Request, you will be sent an RMA number. The RMA number is vital to allow us to match your incoming product with your contact information and the trouble report that you have filled out prior to shipping your product to us for repair. Customers in Europe and Asia can typically receive faster turn-around times from a nearby International Service Center. See our list of International Service Centers to contact the center nearest to you. You can find answers to many questions about the return process in our Service FAQs. What product models can AE Techron service? Can you still repair my legacy product even though it’s no longer being manufactured? Any current and most discontinued product carrying the Techron or AE Techron brand can be serviced through our Factory Service Center. However, some discontinued models can no longer be repaired due to problems with parts availability. Our world-wide Authorized Service Centers can provide most repair services for current AE Techron products. Do you have a flat rate for repair? We do not have a flat rate for repair. Because of the wide range in repair costs (from a broken wire to a complete rebuild), it is difficult to come up with a price that would be fair. Instead, at the time of your initial contact, we can provide typical repair costs for your model. We also can accept a P.O. listing a "not to exceed" amount. If you prefer, we can perform an Evaluation to estimate the cost to repair your unit. The cost for an Evaluation is $75 for current products and $90 for discontinued products. If you choose to have the unit repaired, the Evaluation fee will be credited toward the final repair bill. What is covered by AE Techron's one-year warranty? Do you have a service center in my area? Plus, customers located anywhere in the world can always send their product to AE Techron Factory Service. Typically 3-4 weeks or less. Yes. Typically we can turn around your repair quicker if requested. Rush rate service is available for a nominal additional charge of $20 per hour. 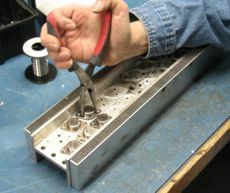 We cannot always guarantee rush status depending on parts availability and the extent of the repair. Please request rush rate at the time of your RMA request. A lot is required of the driver transistors and output transistors in your amplifier. These parts create heat and suffer from thermal wear, so they are the parts most likely to fail over time. And, since these parts all wear at approximately the same rate, when one goes, the others are likely not far behind. If you need to have your amplifier repaired to replace one or more transistors, you may want to consider using our amplifier rebuild service instead. During the rebuild process, these output transistors and driver transistors will be replaced with new, latest-version parts. We'll also clean and inspect all parts, replacing other worn, obsolete or problematic parts with the latest revision level, so your rebuilt amplifier benefits from our latest performance and reliability improvements. The amplifier then undergoes extensive testing to ensure reliable performance. When complete, your rebuilt amplifier is placed back under factory warranty. 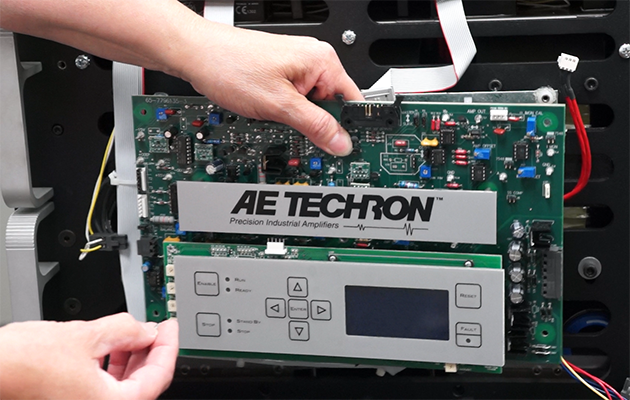 To learn more about the AE Techron Amplifier Rebuild Service, contact the Service Department Coordinator. Call our Service Department at +1 574-350-2393. You can reach our Technical Support department M-F, 8AM - 5PM, US Eastern time. We will respond to all inquiries within one business day. You can reach our Service department M-F, 8AM-5PM, US Eastern time. To return your product to the factory for servicing, please complete our online Service Request form. Or call our Service department to have a Service Ticket issued via phone. AE Techron Authorized Service Centers are available in Europe and Asia for customers in those areas. These Service Centers can provide most repair services for current AE Techron products. Technical articles about AE Techron products.